Provides material for homework assignments, classroom demonstrations, and periodic reviews. A generous assortment of excerpts from the literature for assignments in analysis. Volume II corresponds with the second half of the text. Used this book for one of my classes. It was great for writing right on the pages then ripping them out to turn them in. The pages are pretty thin though, so you can push through them if you write hard like me. 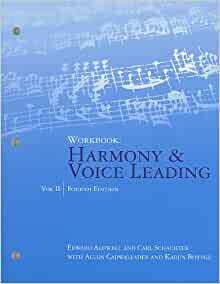 As part of my review for the Graduate diagnostic music theory exam at WSU, I find this text to be very helpful.